Beauty from within is now an easy possibility with skin glowing antioxidants, which are quite a catch to keep the process all healthy. 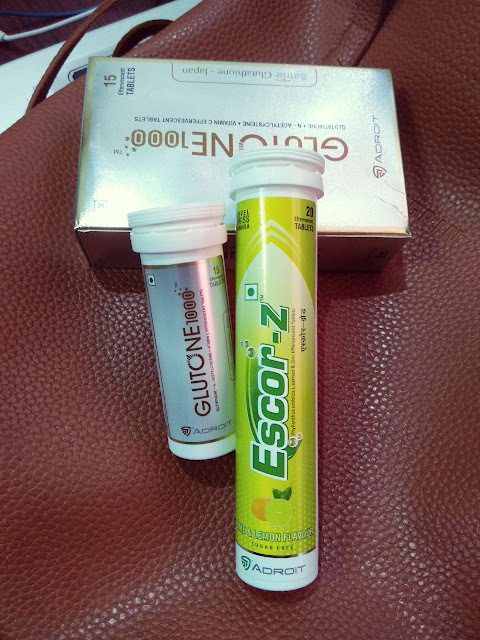 As much as we stress on the importance of the beauty inside, we also realize how the beauty within reflects similarly on the exterior, so why not balance both with a blend of happiness and combination of Glutone 1000 and Escor-Z. First, let’s take a moment to understand what Glutathione is…It is an antioxidant which works to keep our immunity, toxic levels, skin health and more in check by ensuring optimum health for cells in our body. No wonder why it is called the master antioxidant! Aging is inevitable, when with age the, Glutathione levels start declining. So to counter this, an oral supplement like Glutone 1000 would be an apt choice to maintain aging in a healthy manner. 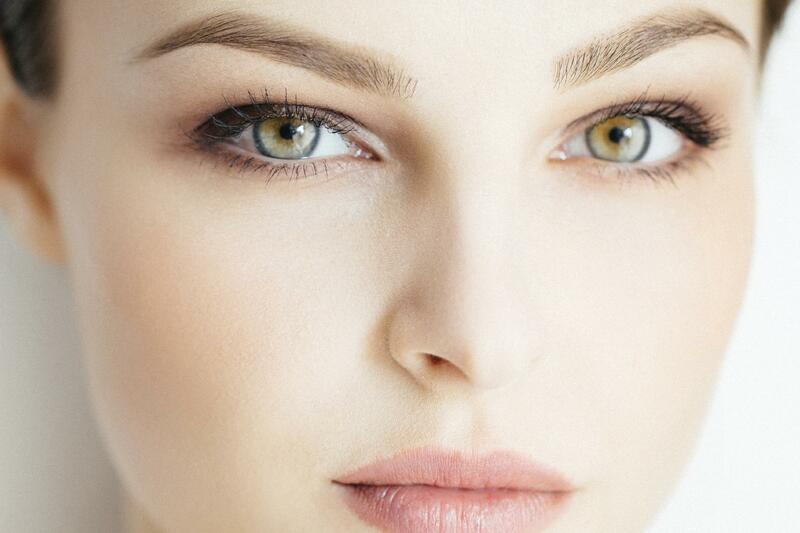 How does Glutathione help in lightening the skin, like it is glowing from within? The benefits are multiple with Glutathione, including skin lightening, detoxification and tackling skin aging. Our system carries two melanin pigments, one lighter melanin called pheomelanin and the second one responsible for the dark pigment called the eumelanin. Here, Glutathione boosts up the flow of pheomelanin, creating increase in the production of the lighter melanin. Ensuring delivery of the best glutone available worldwide, Glutone 1000 is made up of Setria Glutathione which is GRAS approved. 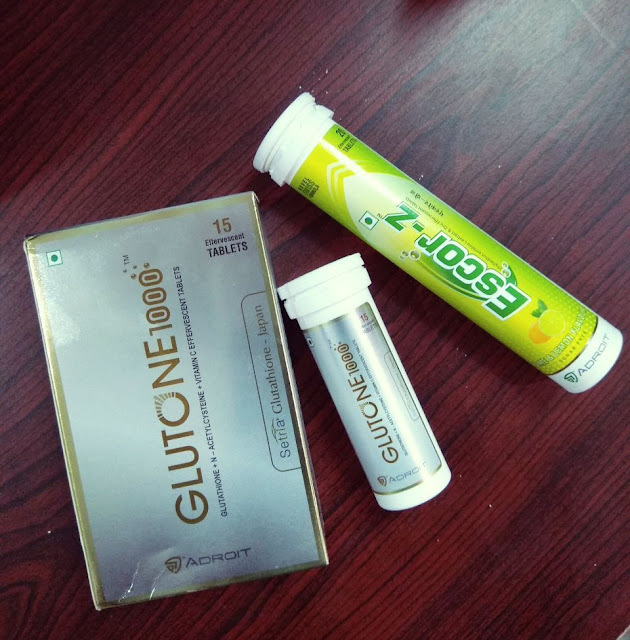 A healthy supplement option to channel skin lightening and its related benefits, Glutone 1000 contains L-Glutathione, Vitamin C, N-Acetycysteine for an overall skin tone improvement and makes immune system efficient. A really tasteful, fizzy health drink, this supplement is perfect for infusing anti-oxidant in the system, reducing wrinkles and collagen synthesis in the skin becomes an advantage. Taking the legacy of healthy supplements ahead, Escor-Z brings with it the goodness of Vitamin C like no other along with zinc to balance the skin tissues and oil glands. Club with it flavors of lime and lemon, an everyday favorite drink is ready in no time. Escor-Z contains rich extracts of gooseberry, which again is one of the most effectives in providing Vitamin C. This supplement is consumed as a flavourful effervescent drink, very readily helping in fighting free radicals and skin tone issues. Why we need it in our daily supplement diet is because of a simple fact, where free radical overload hampers the skin health, by damaging the collagen and over production of melanin in the system. Balance the melanin pigmentation in your skin, and enhance the skin tone while contributing some quality production of anti-ageing protein too. The best part is that it comes in the lemon and lime flavour and has a faster result post consumption of Escor-Z supplement. How to enjoy this supplement best? Make the most of this skin enhancing combination, where results appear in the timeline of 30+ days of its usage. All you have to do to include this in your diet is, have 1 tablet of Glutone 1000 and Escor Z each, fused in a glass of water. On an empty stomach in the morning, this fizzy drink can be consumed like a flavoured drink. It is suggested to drink this supplement for 4 months at least. If you do not require the zinc level as provided in Escor-Z, you can opt for EnerC- 1000 with a distinct orange flavour to quirk up your supplement intake. The flavour will definitely escalate your liking for the drink, and also will help your system regain the needed fusion of detoxifying and skin lightening elements. Glow doesn’t come with medication, but with supplements which carry extracts of natural ingredients. Making this combo a part of your morning routine means adding health and care in a measured way, you can’t go wrong with this. Radiate naturally, because you deserve it.